Reproduced from Hay, G., (2007) technical article Why burn paper?, The Journal of Australian Ceramics, 46, 84-86 with permission from the author and editor. More articles by the author here. ​Some modification of layout has been made to improve reading from a screen. Imperial measurements have been added. Graham Hay looks for future directions in the quiet paperclay revolution. Many people using paperclay (processed cellulose fibre added to clay) don’t describe it as such. This is because the firing burns out the fibre, it keeps written descriptions short, it conceals the source of their technical skill in clay, and avoids any confusion with papier-mâché. Consequently, the extent of paperclay use in Australia is understated. I was surprised to learn from Western Australian retail clay outlets, that over the last decade paperclay has increased to over a third of bagged clay bought by artists, craftspeople and schools. A similar trend is likely internationally. Rather than restate these reasons, or define paperclay and how to use it, I ask novices to look at the 50 paperclay journal articles, on-line discussions and list of suppliers at www.grahamhay.com.au. Given the spread of paperclay through the clay community, I want to look further ahead. As part of this process I want to radically question our total dependence upon firing. This questioning has the potential to divide and stagnate, or invigorate our clay community. So, please be open-minded and positive! Apart from some temporary installations at conferences and performance pieces, unfired conventional clay work is never a serious option because it is so fragile when dry. But the cellulose fibre in paperclay substantially strengthens the dry paperclay body. This means it has real potential for indoor decorative work. With the decline in the functional ceramic market (due to cheap imports), the declining number of training institutions (due to falling vocational enrolments and internal financial pressures) and growing environmental concerns, maybe it’s time for us to adjust our conventional thinking. Why use an expensive kiln to fire decorative objects which sit in dry interiors anyway? Why waste time loading and unloading the kiln? Given the escalating environmental problems facing us, along with likely skyrocketing utility costs, why use precious natural energy resources firing a kiln to make decorative objects? Why bisque fire (unnecessary with paperclay), when the second and subsequent firings reduce the physical strength of ceramic materials anyway? Why not be able to change the unfired work if it loses appeal? Why not drop it in a bucket and recycle it into a completely new object, rather than have it eventually becoming landfill? Already other sections in the craft community are embracing these ideas. Historically, all the paperclay pioneers – Carol Farrows (UK), Rosette Gault (USA), and Jaromir (Mike) Kusnik (Western Australia) – have borrowed techniques from papermaking. Now the reverse is happening with the papermaking and fibre art communities embracing paperclay techniques. Australian fibre artists are interested in creating customised paperclay, or ‘clayfibre’, using cotton, recycled paper, and other processed and unprocessed fibres. Indicative of this new interest, I have been invited to give seven workshops with papermaking, textile and fibre groups in Victoria, Queensland and Western Australia. In summary, paperclay offers an opportunity for adventurous readers to respond to changes underway by altering their studio practices. One of these emerging ways is to not fire decorative work. 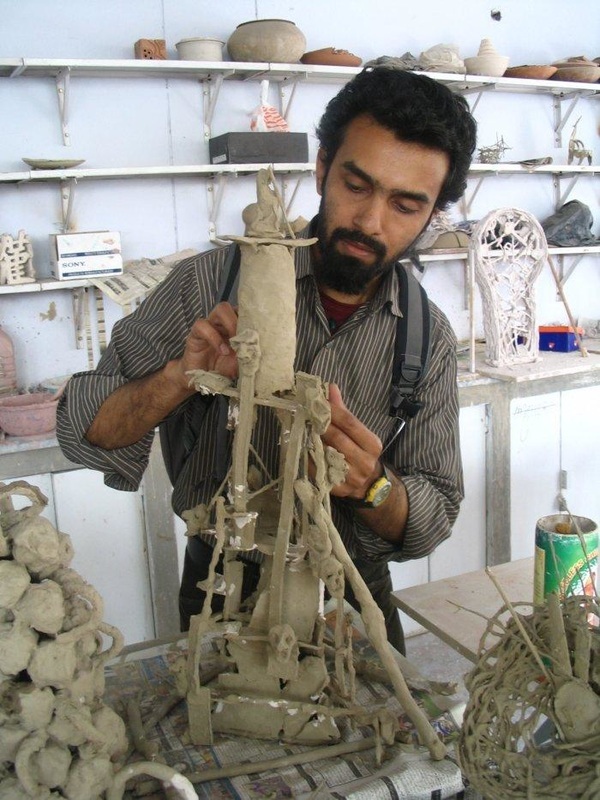 Akber Moeen, 4th year sculpture student, completing his unfired exhibition piece, Faculty of Ceramics Design Department, NCA, Zahoor ul Akhlaq Gallery, National College of Arts, 4-Shahrah-e-Quaid-e-Azam, Lahore, 8 April - 22 April, 2006; photo: courtesy of the artist. 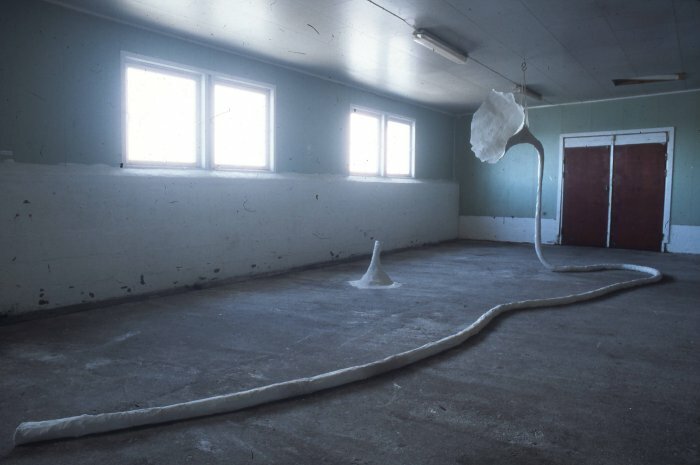 Malene Pedersen, Longing for the Ocean, 1999, fibreclay, chickenwire (unfired, recycled after exhibition), Pedersens fish factory, Norway, h: 3m/10ft, w: 10m/32ft, d: 2.5m/8ft, photo: artist. 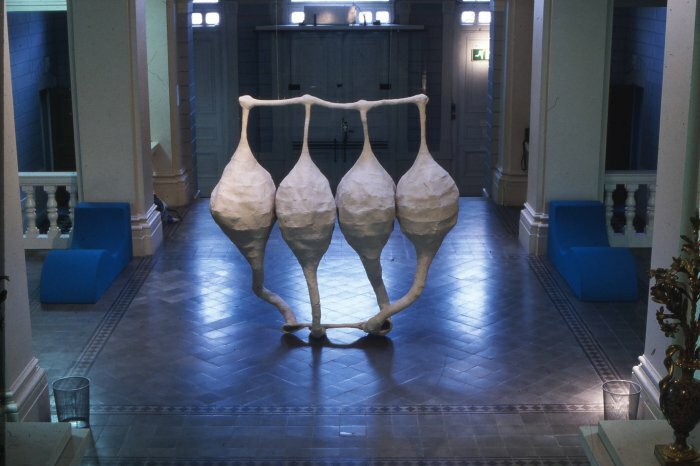 Malene Pedersen, Juxtaposed, 2003, Vestlandske Kunstindustrimuseum, Bergen, Norway, unfired paperclay, wood, h: 2.3m/7.5ft, w: 2.5m/8ft, d: 7m/23ft; photo: artist. Graham Hay is a member of the Robertson Park Artists Studio in Perth, as well as being an exhibiting artist and running paper clay workshops. to read more paper clay articles click here.